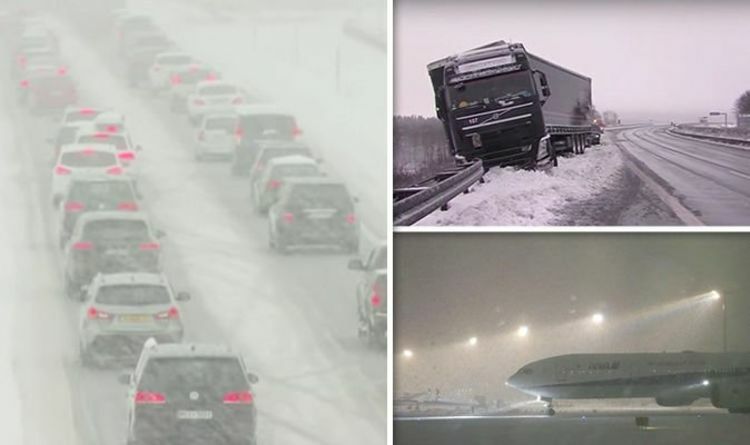 Heavy snowfall is causing widespread and severe travel disruption across Europe this weekend. The Met Office has even warned of impending avalanches in Austria, Germany and Switzerland due to the sudden outbreak of snow. Dozens of flights have been cancelled and at least two people have died throughout Europe as meteorologists warn the icy freeze could get worse next week. Officials in Greece have announced that one person has died and two are missing following violent blizzards sweeping across the country. In Germany, one person died and two people were left seriously injured after their car skidded into oncoming traffic on icy roads. Authorities say they are also monitoring for possible avalanches, while the avalanche danger in the southern Alps is at Level 4, the second highest warning level. Several towns in Austria have been evacuated because officials feared strong winds could trigger a large avalanche. Other small Alpine towns have been cut off by the snowstorms, leaving around 600 people trapped across the Alps. Fears over avalanche has also prompted rail cancellations and road closures across Central Europe. The Met Office tweeted: "Significant snow is expected across parts of the Alps, especially in Austria, Germany and Switzerland. "1.5 metres of snow is possible by midweek, bringing a high risk of avalanche." The Arctic blast has seen temperatures in Greece and Turkey struggle to reach above freezing this week. Munich Airport, the second largest in Germany, was forced to cancel more than 200 flights while workers cleared runways of snow and de-iced planes. Flights officials warning that “current weather conditions have caused major restrictions in air traffic”. A spokeswoman for German state police in Upper Bavaria said that the storm, named as Andre in Europe, has caused "about 25 accidents because of slippery roads". Further significant snowfall is forecast for southern Germany, Austria and Switzerland in coming days. Austrian authorities warned against off-trail skiing, adding that “many large, several very large avalanches are likely” that could affect roads and rail lines.